Thought to date to mid to late 900 AD, 52 undamaged beads were found and struck back together in order to recreate the famous 'Pagan Lady' necklace. 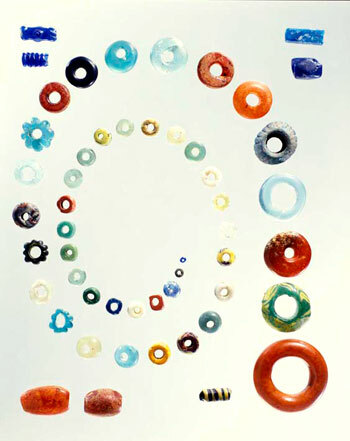 Every bead is different: most are made of plain glass, coloured patterned glass, and a few others are of amber and jet and faïence. Their shapes also vary - round, square, rectangular, oval, flower-shaped, melon-shaped, spiraled and grooved beads are all represented. The largest bead is 3.3cm in diameter, whereas the smallest is only 0.3cm diameter. Both the number of beads found and their variety is striking. 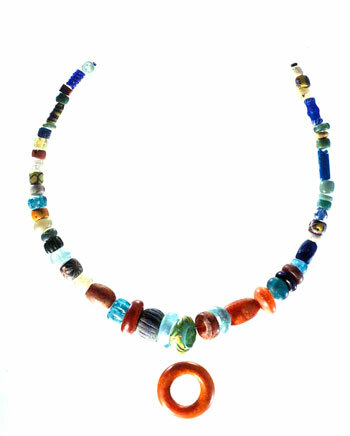 It's likely these beads had been brought to her as gifts from trading or travels around the Viking world. In 2007 the Museum approached Julie to make a replica for display in their new Viking gallery, a prestigious and important commission. An exact replica was fabricated after extensive study of both the techniques of the Vikings and their equipment, and of the originals themselves, through photography and drawing. An exact replica is available on a commission basis only.